A few weeks ago, seminal New York Times food critic Ruth Reichl revisited Dan Barber's Blue Hill at Stone Barns in Pocantico Hills, N.Y. At his flagship farm-to-table restaurant, Barber is known for presenting meats and vegetables from his onsite farm in their barest form and letting the ingredients speak for themselves. In her review, Reichl describes an early course: "Cucumbers," she writes, were served "simply sliced and so sweet I was reminded that cucumbers belong to the melon family." While I have mixed feelings about Dan Barber's impact on the food movement, Reichl's review reminded me that fresh, beautiful ingredients are best handled with minimal fuss — and that off-the-vine cucumber season lasts just a few weeks. So when a farmer friend directed me to a table full of fresh produce from Killdeer Farm at a party this weekend, I grabbed up a half dozen cukes, dreaming of a simple, spicy salad. 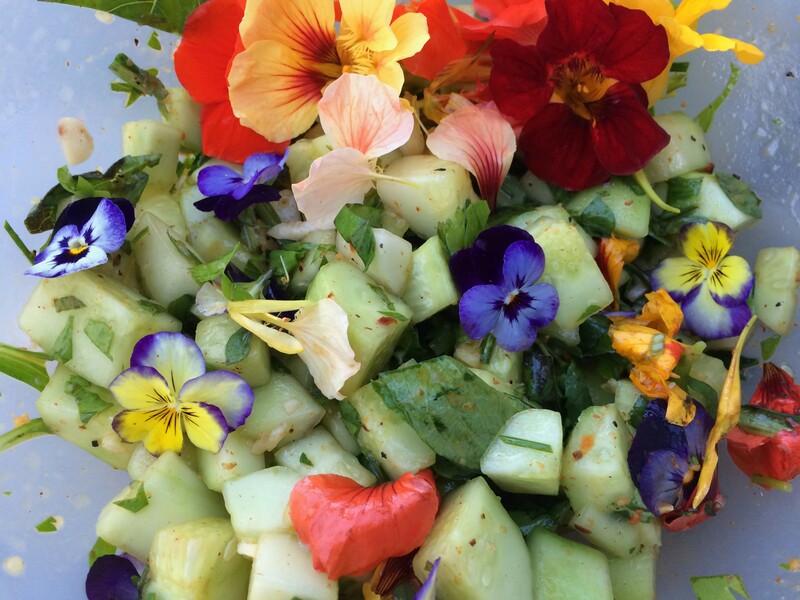 With a chicken roasting on the grill Sunday night, I picked some fresh herbs and nasturtiums (the flowers lend a green, floral, spicy note, similar to a radish) from the garden and threw these in with the Killdeer cukes and some oil and vinegar. All told, it took about five minutes to prepare. And guess what? It was great. Cut the cucumbers and garlic to size and place in a bowl. Add the salt, oil and vinegar and stir gently, then add the peppers, herbs and flowers (reserving a few flowers for garnish) and stir again. Let sit a few minutes and stir again to redistribute the liquid at the bottom of the bowl. Garnish with a few fresh flowers just prior to serving.